Let the pallets build awesome furniture for you and you will find them worthy a lot to solve your custom furniture issues! 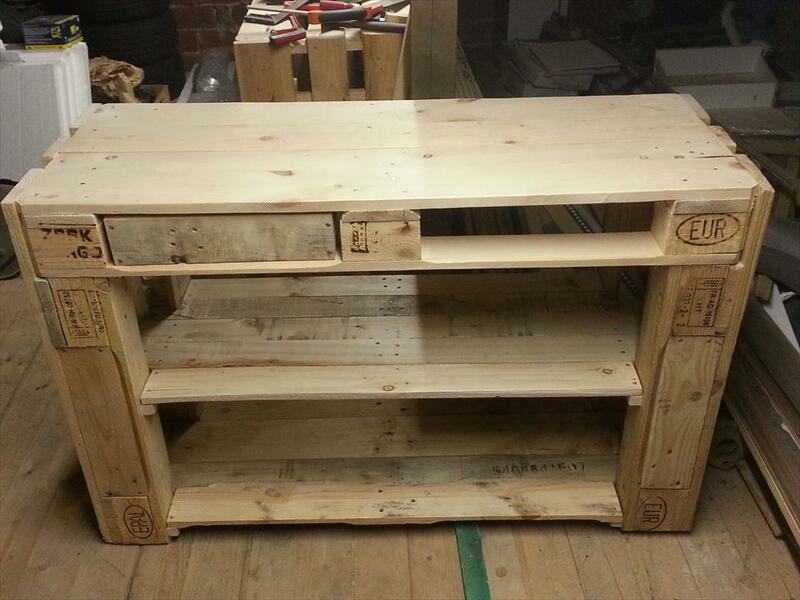 To build custom furniture design in custom dimensions is something what for which the pallets always come in handy! Make some creative adjustments in pallets boards and gain this DIY pallet sofa side table having multiple drawers and shelves inside to display, manage and store your functional and decorative items! Restructure the pallets to build up the sturdy but easy frame of this pallet furniture and put the separately made drawers in for a complete design of storage-friendly side table! This table can also hold a prominent position at your entryway and can showcase your mural frames, antique centerpieces and decor beautifully! Drawers would make it easy to securely store your all time needed items and also the tools you may need for some instant repairs! 2 drawers, 2 build in shelving levels and a flat top would give you some mind blowing ways to store the clutter and to create showy looks of your decors! Also adapt it as media console table as it is having all required features for that! 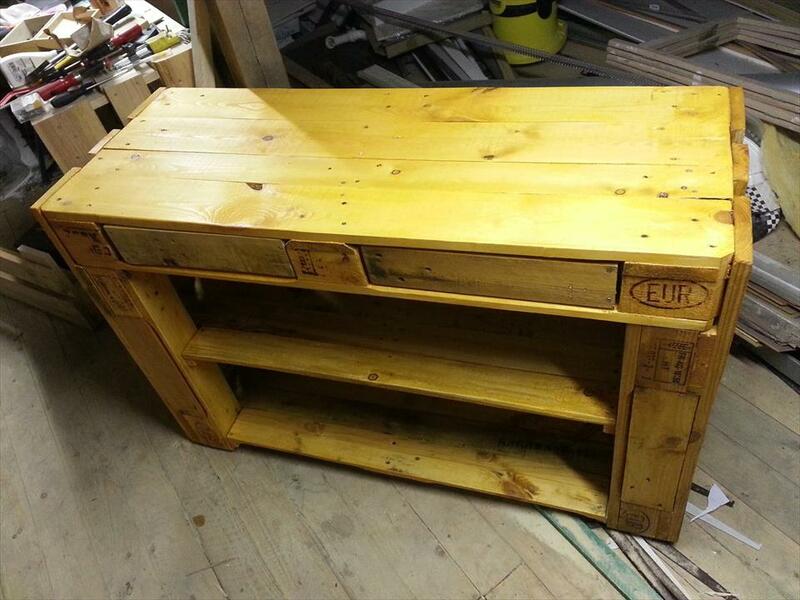 Look at this frame built with pallets, it will beautifully make a media console or TV cabinet If placed in your media room or in TV lawn! A trimmed down EPAL pallet skid has been installed as a top of the table and two trimmed down sizes make beautiful and thick side walls of it! Here a custom light yellow look has been created but can go with your own consent to let it rock to your interior environments! The design is rustic yet modern and hence would be compatible to each style of interior decors! In accord to openings in pallets, the drawers have been build using selected sizes of pallet planks! Here only 2 drawers have been achieved but you can increase their number in your case! This time it is playing a functional role of side table but you can even employ it as a hallway console, window side table and also as an entryway or foyer table just to make bigger compliments to home decors! Using leftover pallet slats the two solid shelving levels have been installed to bottom side of it and hence this whole layout of table provides ample space for storage and display! It would make a precious pallet TV stand if placed in your media room as flat top would create a prominent display of your TV screen while built-in shelves can organize your media items along with enchanting display!